I haven’t been making monthly goals because I haven’t had the time or energy to commit to them. School ends next week though and I only have 2 finals so I should be home free after that to commit to my health. 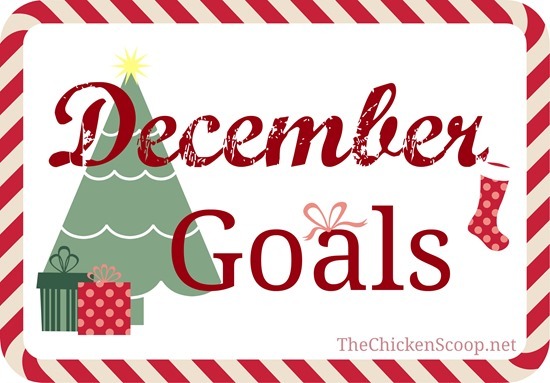 So these are less of December Goals and more like Last 3 Weeks of December Goals. I’ll use this week as a warm up and see how it goes. Anyway, here is what I have planed. I know I was supposed to start yesterday but this week quickly went downhill when it comes to free time. I’ll be busy super Wednesday and Friday this week also so the new plan for Body Beast is to start within the next week or so and to commit to it. That is, to continue doing the workouts throughout the rest of the month (and then the rest of the entire program). Better late than never? Eat real food, eat clean, eat natural, whatever you want to call it. I have my own definition of natural, wholesome food and I need to eat it more often. I have been eating out way too often, eating too many sweets and treats, too many calorie-filled beverages, not enough water, too much packaged crap, etc. We all know what healthy food is. That is what I should be eating! I always struggle with water but it is even worse than ever lately. If I get rid of caloric drinks, adding water in should be easier. It also keeps snacking at bay which means eating less crap. And that’s it! I don’t want to get too complicated right now. Like I said, school ends in 1 week and then finals and research and stuff. Also, residency applications have started so I will soon be traveling a ton for interviews (well, hopefully anyway!). The work never ends. I just hope that during winter break, I can get back into better habits that I can carry through next semester without too much trouble. I’m never good at water. I’ve been trying for years! Great, attainable goals! I need to sit down and put pen and paper to mine! This month I am also trying to eat clean. Been too over indulgent! Good luck with your interviews. plan and simple. you got this!! !